In recent years, advances in magnetic resonance (MR) imaging technology have led to a greater role for this modality in the detection and staging of breast cancer. MR systems designed for breast imaging, improved gradient coils, and the ability to perform MR-guided biopsies have all played a part in its proliferation. Contrast-enhanced MR imaging of the breast is thought to be particularly useful in cases in which the mammographic findings are inconclusive, in women with dense breasts or small lesions, in cases of lobular carcinoma, and in detecting lesions in the contralateral breast in women with known cancer. "Contrast-enhanced MR can be used to see cancer since, in order to fuel its abnormal growth, cancer demands a large blood supply," explained Olivia Ho Cheng, President and Chief Executive Officer, Aurora Imaging Technology Inc. (North Andover, MA). "When injected, the contrast agent gadolinium travels through the body and, because of its metal compound, attaches to the blood vessels for roughly 10 minutes. Because MR is sensitive to metal, these deposits show up on the MR image during that 10-minute period." Aurora began in 1985 as an engineering firm that specialized in gradient coil design, and it now manufactures the Aurora 1.5T Dedicated Breast MRI System with Bilateral 3-D SpiralRODEO. This system was designed specifically for use in breast imaging. It features a 450-lb weight-limit massage-style table that is contoured specifically for breast anatomy and a 64-cm gantry into which the patient enters feet-first to lessen any potential problems with claustrophobia. "With our design, the patient lies prone, and the breasts are suspended from the chest wall," said Cheng. "The area to be imaged is not moving nor is it greatly affected by respiration, but it is a very large area. This is different from the more common scenario of an organ that is in the body and is moving but is smaller. To address this difference, we designed a gradient coil that is very precise for a large area, and our signal is very accurate over a very large area of imaging." According to the company, the system precision gradient has a distortion of <1 mm over 44 cm, providing an elliptical, homogeneous 36 × 44-cm field of view for coverage of both breasts, the chest wall, and the axillae with a single scan (Figure 1). One challenge in MR imaging is finding the proper balance between resolution and dynamics. Aurora addressed this with their SpiralRODEO technology. "The breast is a very fatty organ, and the older you get, the fattier the breast becomes," said Cheng. "With contrast-enhanced MR imaging, both fat and cancer show as bright white. In order to take the fat signal out, the user must suppress that signal. RODEO (Rotating Delivery of Excitation Off-resonance) excites the water so that the system is able to separate the peak between fat and water. If you selectively excite water, you can distinguish it from nonexcited fat and eliminate it. Rather than being a fat-suppression technique, it is actually a water-excitation technique. It is a much more effective way to do fat suppression-in reverse, by exciting water." The other half of this technology is known as Spiral. "When you image using a traditional 3D Fourier transform reconstruction technique, you acquire data in 2 dimensions-1 line at a time from side to side," noted Cheng. "However, when you inject contrast, the enhancement starts from the center and spreads outward. With Spiral, we start the image from the center and draw a circle. Using the Spiral technique, we can get the image out much faster and with a lot more data. That is why our system, even with 1.5T, has the efficiency of a 4.5T magnet." AuroraSUPERSHIM and AuroraCAD are also features of this system. AuroraSUPERSHIM is a customizable shimming method that recognizes differences in anatomy and automatically adjusts the magnetic field of homogeneity. The AuroraCAD feature facilitates the simultaneous viewing of axial, sagittal, and coronal views of any image using multiplanar reconstruction, as well as side-by-side comparison of images including pre-and postcontrast images, subtractions, 3D projections, and enhancement curves. 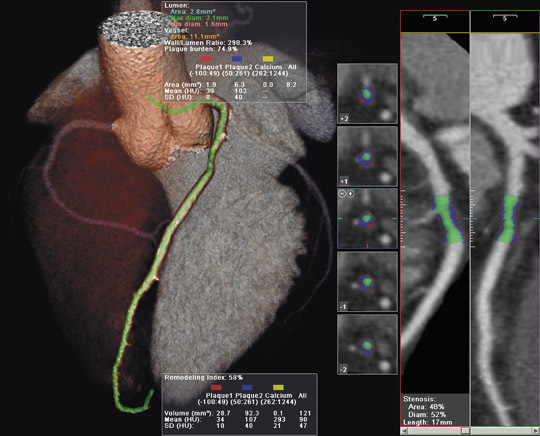 The system also includes integrated interventional functionality in the AuroraBIOPSY feature. "MR imaging, because it is so much more sensitive, detects 2 to 3 times more cancers than mammography," said Cheng, "but many of these cancers are invisible via mammography. So if you can't see it, how can you biopsy it? Therefore, we developed an MR-guided interventional system that allows the user to see the lesion, mark it, and target it." The system is able to accommodate both core-biopsy and vacuum-assisted- biopsy devices. The user clicks on the target lesion on the screen and the system automatically moves the needle to the proper area without the user having to count grid squares. "It was just beyond me to see doctors forced to count squares when performing a biopsy," Cheng said. "The contrast stays in the body for only 10 minutes. During that time, the physician has to be able to decide what to target for the biopsy. We didn't think it was possible to ask doctors to calculate while under that time pressure, so we made it all automatic." "Breast MR imaging has really come a long way," said Cheng. "In the beginning, people didn't know if MR could even be used for diagnostic purposes. Now that, diagnostically, MR imaging is considered the 'Supreme Court' for cancer, more people are asking why not use it for screening, especially for high-risk women who cannot afford to be misdiagnosed because their cancer tends to have faster growth rates." In 2007, the American Cancer Society published recommendations for MR screening for women with a 20% to 25% lifetime risk of developing breast cancer. 1 "So now we are seeing breast MR imaging for screening in high-risk women across the nation," said Cheng. "My belief is that eventually it will be used for general screening. When you say 25% risk should be considered high risk, how about 20%? How can you say that 20% is not worth having MR used for screening? Or 15%? Currently, 90% of new cases of breast cancer are in women who have no family history of breast cancer. So, who is high risk? If the tool is truly useful for screening, eventually, we, the industry, will have to find ways to reduce the cost to make it more efficient as a screening tool." Saslow D, Boetes C, Burke W, et al. American Cancer Society guidelines for breast screening with MRI as an adjunct to mammography. CA Cancer J Clin.2007;57(2):75-89. Technology and Industry: Magnetic resonance imaging of the breast. Appl Radiol.